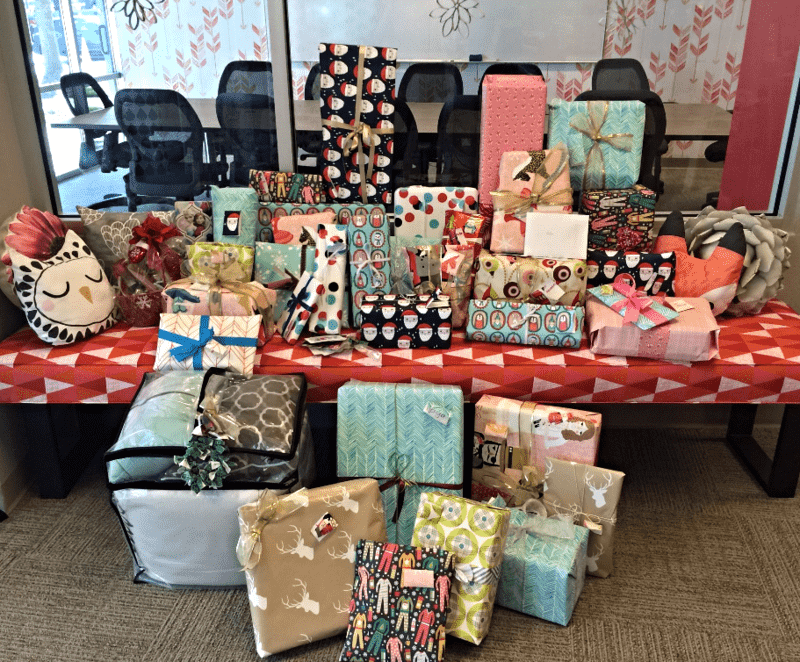 This year, the newly formed volunteerism committee here at Spoonflower decided to sponsor a family for the holidays. Spoonflower staff member Kelly B. is here to tell the story of how we paired up with the Volunteer Center of Durham and received a family of 6: two boys, three girls and Mom. Their requests were modest and the Spoonflower gang overwhelmingly sprang to action in an effort to spoil them as much as we possibly could! The project started with making a tree. I found a tutorial that we modified and covered with Spoonflower’s woven peel and stick wallpaper! 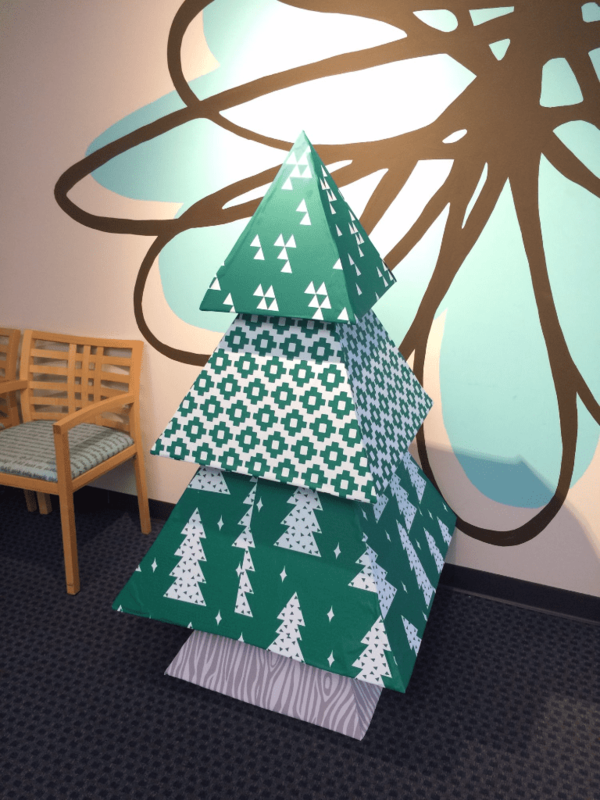 We used Simple Triangles – Kelly Green by Andrea Lauren, Aztec in Green by Little Arrow Design, Triangle Tree – Kelly Green by Andrea Lauren, and Mod Grain – Grays by Third Half Studios for the trunk! 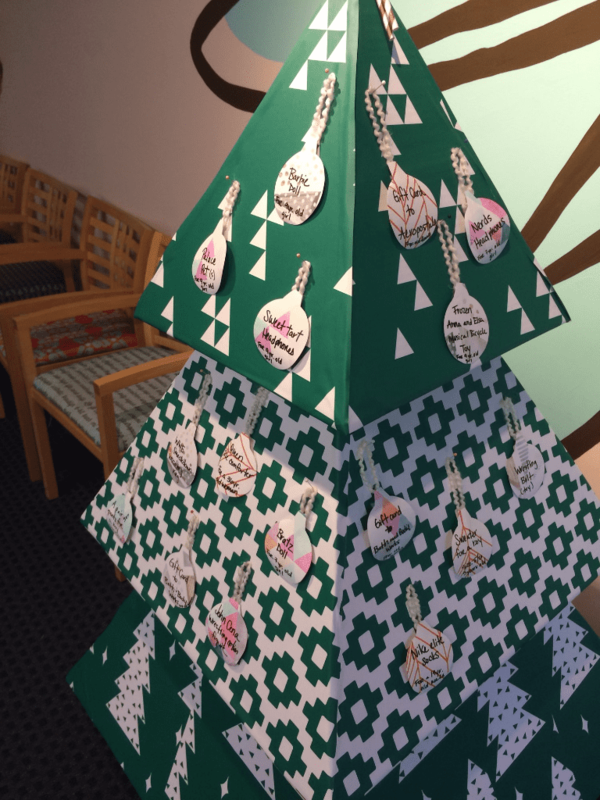 Next, we added ornaments with items that the family requested written on them. 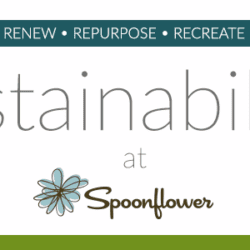 All of Spoonflower were invited to choose an item to donate. I was moved by the response to this effort and the generosity and love that everyone brought forward. 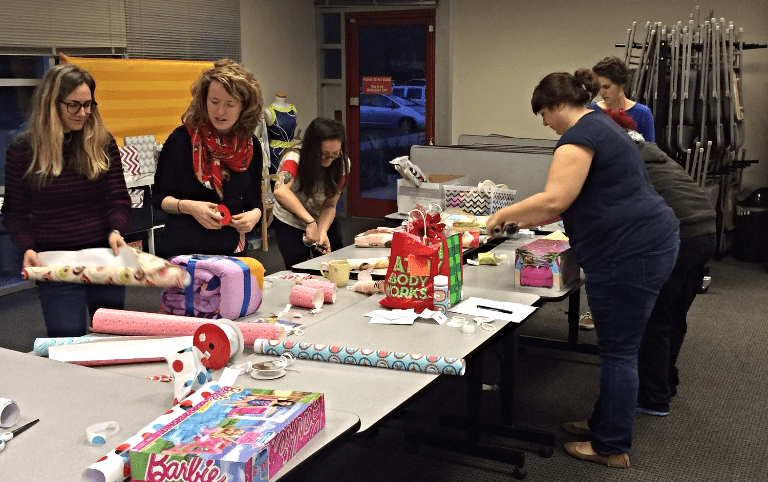 The volunteerism committee gathered in The Greenhouse one evening after work to wrap all of the presents in Spoonflower gift wrap. Luckily, we work with a band of creative souls and all of the gifts were stunning! Thank you to all of the Spoonflower employees for the outpouring of support, my cup runneth over with spoon-love! We'd love to hear what all of you are doing this holiday season to support your local communities. Please do share your "giving story" with us in the comments below! Absolutely fabulous! I wish every business around the world did this at Christmas – it would certainly make a big difference. The Gift of Giving!! Just the best. 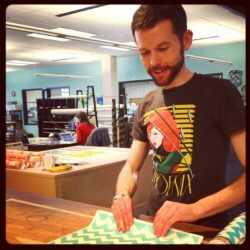 Thanks so much Spoonflower for being a great place to work and encouraging us to give back to the community.